. Kanai anzen 家内安全 "peace at home" . According to the Nihon Shoki history, Nagata Shrine was founded by Empress Jingu Kogo 神功皇后 at the beginning of the 3rd century, when she came back from her war with Korea and was on her way to Kyoto. 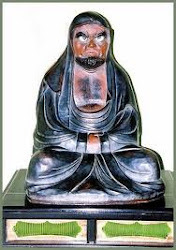 She therefore venerated the deity Kotoshiro nushi no kami 事代主神, the son of Okuninushi no mikoto 大国主命. the shrine Ikuta jinja 生田神社 in central Kobe to honor this deity. They all have a history of more than 1800 years. A male and female make a pair. They are white, with a red head and a bit of black on the tail feathers. They are the sacred animals of the deity in residence, Kotoshiro nushi no kami 事代主神, the son of Okuninushi no mikoto 大国主命. 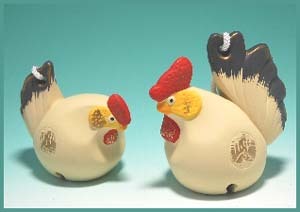 The foreigners called it "chicken temple"チキン・テンプル. BTW, the chicken were all eaten, but now there are more doves than chicken. Because of this background, the shrine is close to the imperial family history and also to the regents of Japan. Some famous wariours have their little shrines here. The shrine was badly damaged during the Great Hanshin Earthquake on January 17, 1995, but has been repaired around 1997. 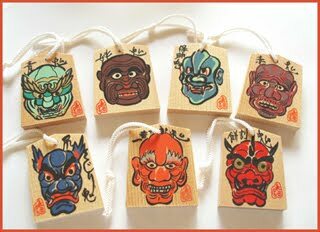 Kotoshiro nushi no kami 事代主神 is also often seen as one of the Gods of Good luck, Ebisu. 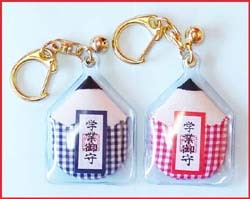 Therefore dolls of Ebisu and Daikoku are sold at the shrine. 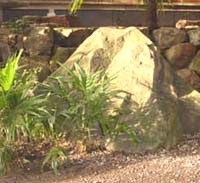 The red stingray tablets hang near the small shrine Kusunoki no Miya Inari Jinja 楠宮稲荷神社. The old camphor tree (kusu no ki) is more than 800 years old. Once upon a time, a group of red stingrays came up swimming in the river Karumogawa 苅藻川. The villagers went after them, but lost sight of them near the old camphor tree. Since that event, the tree is seen as an incarnation of the red stingray. If you buy a votive tablet and make a wish, it will heal your hemorrhoids. The red manta are a speciality in the waters of Western Japan. I am trying to locate a photo of them. Sometimes paper dolls were placed under the main mast of a boat to appease the Gods of the Ocean. They are the origin of the simple paper figures (katashiro 形代) used for purification rituals twice a year.
. Hina Doll Festival (hina matsuri 雛祭り) . At this shrine, the demons are not seen to bring evil and bad luck, but to protect the humans and burn evil in the fire of their pine torches and cut bad influence with their large swords. People try to catch some sparks of the torches to purify themselves and carry some fire home. It brings good luck to the family. Eating some of the flowers made from rice flour 餅花 will protect from illness and protect the family. Apart from these seven demons, there are five children up to age 10, wielding the swords. This is a time for the little boys to show their bravado and fearlessness. In former times, all these people had to be inhabitants of Nagata village.
. WKD : 節分 Setsubun, the "Seasonal Divide"
List of annual festivals at Nagata shrine.
. Onipedia 日本の鬼 The Demons of Japan . is an annual event that began during the reign of Emperor Monmu (A.D 697-708) and was celebrated at the Imperial Court, shrines, temples, and in homes on the last day of the year, It somewhat resembles the bean-scattering ceremony celebrated nowadays by families. 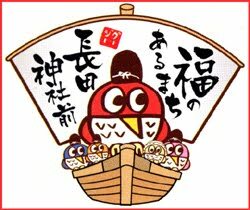 Tsuina is now held on Setsubun (the last day of winter by the old calendar) to celebrate the start of spring on the following day. 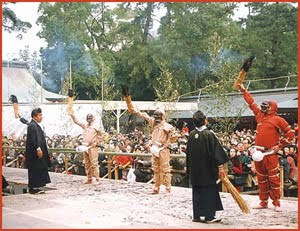 On the day of the ceremony, seven ogres named lchiban Taro Ogre, Red Ogre, Hag Ogre, Hoosuke Ogre, Blue Ogre, Mochi Ogre, and Shirikujiri Ogre, five boys (aged 10 or so) as sword-bearers, and about a dozen stage managers take part in this traditional divine ceremony. Only those people who have lived near and supported the shrine for many years may take the part of the ogres. In order to become purified, they seclude themselves in an "Ogre House" the day before the ceremony and douse themselves with icy cold water practicing their parts: early in the morning of the day of the ceremony, they submerge themselves in the sea at Suma Beach for final purification before assuming their roles. At around 3:00 P.M the ogres come on atage carrying torches of straw and dancing to the sound of drums and trumpet shells. Next, Ichiban Taro Ogre, Red Ogre, Hag Ogre, Ho-osuke Ogre, and Blue Ogre, are given their swords and they soon begin dancing, with a torch in the right hand and a sword on the left shoulder. These messengers from the gods keep dancing until 7:00 P.M when the final mochi cracking ceremony is completed. The flames of the torches burn away all calamity and the blades of the swords cut down all evil coming near. In the Tsuina Ceremony, every participant prays for good health throughout the new year and celebrates the joy of welcoming another spring. Following the ancient tradition, the onlookers take bits of the extinguished torches to hang over the entrance to their home and eat cracked mochi while praying for a peaceful year. "This is a wonderful, special stone. Let us bring it down to the garden of Nagata shrine." So with great effort they brought it down to the shrine garden. "There are so many stones in the garden of our shrine, I think it is better if I take this special one for my own garden." So he brought it to his home in Hirano village. In the night of that day, something strange happened. As the night deepened, they all heard a strange sobbing and weeping sound, coming from the garden. "Someone is crying in the garden" thought his family. I want to go back to Nagata, sniff sniff ...!" But as the priest looked in the garden, he could see nobody. But the sobbing and sniffing went on all night. In the next evening, the priest began to watch the garden. let me go back home to Nagata, sniff sniff ...!" The priest could still see nobody in the garden, but the weeping seemed to come from the beautiful stone, which was all wet on one side. "the stone weeping at night".
. WKD : Ise Shrine and its KIGO .
. Nagata shrine in Tottori . The local deity Nagata Daimyoojin 長田大明神 is enshrined here. 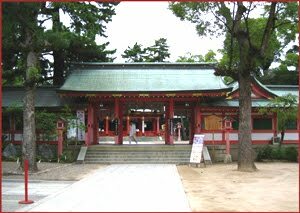 Empress Jingu founded the Ikuta Shrine near Kobe in honor of Wakahirume.
. Folk Toys from HYOGO - Kobe, Himeji .